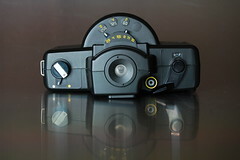 The Horizont is a lineage of swing-lens panoramic cameras similar in design to the Panon Widelux or the later KW Noblex and a departure from its predecessor, the KMZ FT-2. 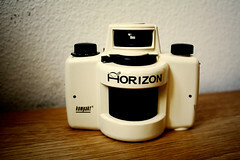 It was produced from 1967-1973 (Horizont, chrome) and again from 1991 onwards (Horizon-202 etc., black plastic). 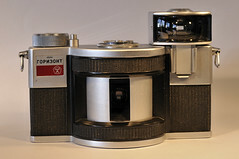 The Horizont, marked in cyrillic Горизонт for the home market, is a sturdy and well built Russian panoramic camera, Some 49,849 were made by Krasnogorski Mekhanicheskii Zavod (KMZ) from 1967-1973. 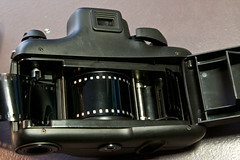 The panning ОФ-28П (OF-28P) 28mm f2.8 lens makes 24×58mm frames on 35mm film, giving a 120° view. 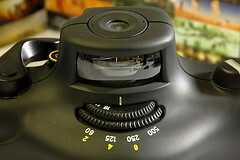 By adjusting the slit width exposure times of 1/30s, 1/60s and 1/125s can be set on the dial at the top plate. An un-calibrated and unmarked 1/250s is also available. In the center of the dial is a film speed reminder dial. 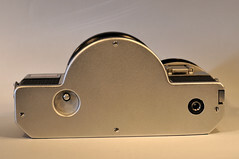 A spirit level is located on the left corner of the top plate, which is covered when the detacheable viewfinder is fitted into a vertical shoe on the front. 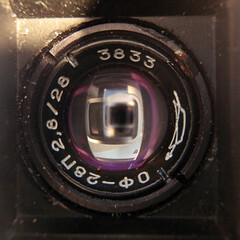 A mirror system allows the user to see the spirit level when looking through the viewfinder. 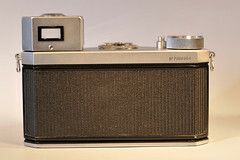 As with most Soviet cameras of that era, the two first digits in the serial number at the back indicates year of manufacture. A complete set also includes a sloping bakelite hand grip to be fitted to the left side of the camera base, and a black leather outfit case. 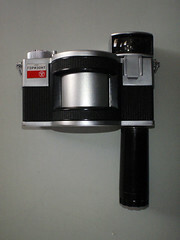 Later variants were supplied with a cyclindrical hand grip and a brown leather case. Some export models have a 'Made in USSR' engraving on the back. Some export models have a 'Made in USSR' engraving on the bottom. Some export models have a 'Made in USSR' and 'Author Certificate' engraving on the bottom. 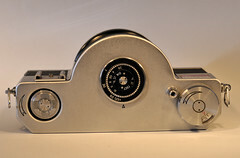 Standard version lacking the 1/250th speed indicatorwith semi-circular recess for the rewind release button. 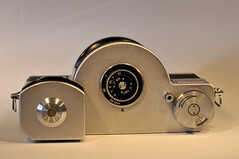 Standard version as above, but with circular recess for the rewind release button. Late version (1972-73), with silver and red name plate. 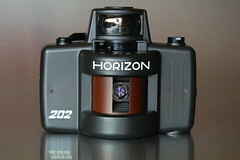 Technopan-202 Rebadged versions of the Horizont 202. 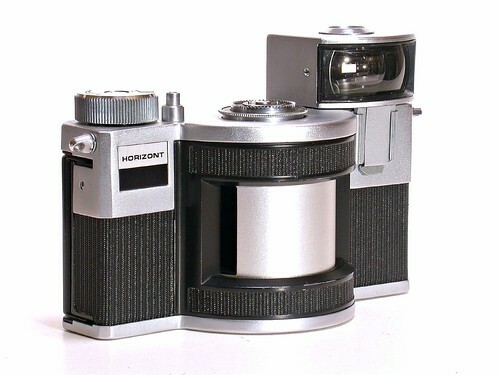 PAN-35SL Rebadged versions of the Horizont 202 sold in France by ¶¶ and in Italy by Silvestri. 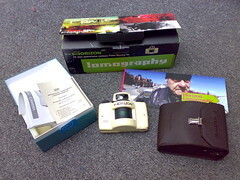 The Horizon Kompakt (Горизонт-kompakt; Lomo model 950) (2005–?2009) is similar to the Horizon 202, but commonly finished in cream, with a knob advance, while the 202 has lever advance. Cream model with coloured face logos attached to the turret (known in green ¶¶). 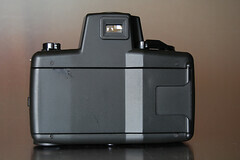 Black model with Russian text (in green) 'Industar MC 8/2.8" or with a green face on the turret. 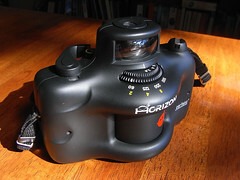 The Horizon S3 was developed from the Horizon 202 (and initially called the Horizon 203), by reshaping the exterior, giving a more rounded appearance. The external shell was now made from ABS plastic which improved resistance to shock and minor damage. The mechanics were overhauled with the aim of reducing the noise emitted by the gears and the turning turret. 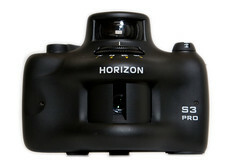 The Horizon S3 Pro is still in production (as of June 2012) by Roxsen|Roxsen Digital Company, a Chinese manufacturer. 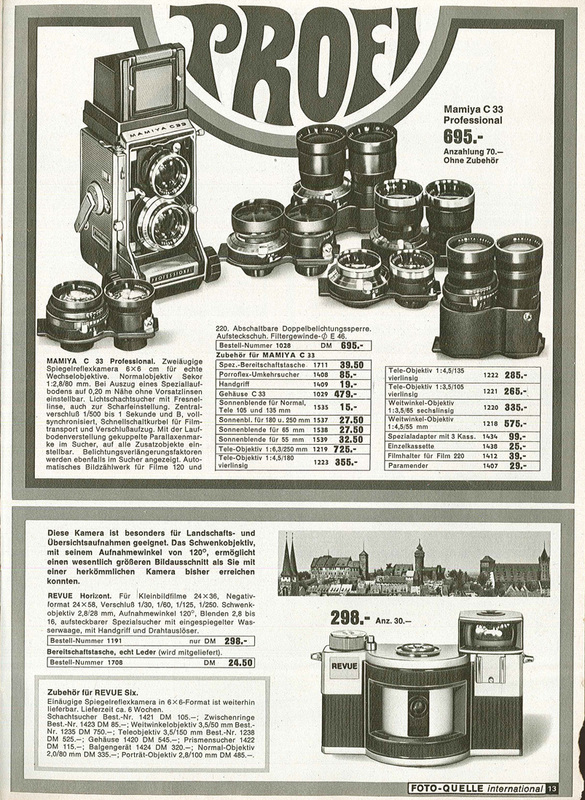 Their website lists the camera as the Zenit Horizon 203 S3 Pro and lists their manufacturing capactity at up to 500 units per week. 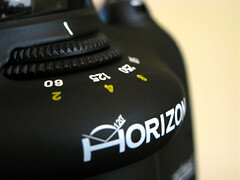 A further development of the Horizon S3-500 but with the removal of all shutter speeds below 1/60th. ↑ 14.0 14.1 14.2 Lomo Site (archived).—Acrylonitrile butadiene styrene (ABS) is a common thermoplastic. Collectors note that ABS plastic is damaged by sunlight! ↑ Examples from star_1+6, and Yuankuei Cheng on Flickr. ↑ Example from Megan Kline on Flickr. This page was last edited on 11 June 2018, at 05:25.